"WARNING: plastic snakes on station to deter birds." This yellow-and-black sign at Townsville's railway station is undeniably eye-catching. It strikes me that plastic snakes might also deter humans. I look all around, but I can't find any fake reptiles. No matter. What's more important is the train waiting for me at the platform. The Spirit of Queensland takes 25 hours to cover the 1681 kilometres from Cairns to Brisbane, but because of flooding across the line I'm joining it instead at Townsville, from where it will take 18 hours to convey me 1341 kilometres south to the state capital. We pull out on schedule in the mid-afternoon, crossing swiftly over Ross Creek; as we run to the east of the ranges, we pass cows in grassy fields, then low green wetlands where I can see waterbirds fishing. My Railbed seat is unlike any I've previously experienced on a train and is similar to that found in business class on a plane. It is contained within its own shell and can be transformed into a bed. Railbeds are set out in a two-one arrangement with lots of leg room. There is carpet underfoot and a large airline-style storage area above for stowing luggage. On the negative side, the seat cushion seems very short, with its footrest sitting just below my knees. Seating quirks aside, the scenery is consistently idyllic through the afternoon, as sugar plantations slide by. It takes what seems like ages to cross the Burdekin River, a broad expanse of blue-brown water. When not gazing out the window I familiarise myself with the seat-back entertainment system. The movies and television shows are fairly lightweight but there is also music, so I indulge in nostalgia via 1980s artists such as the Eurythmics. The Club Car is the next carriage along, with a cafe-bar. I grab a sandwich then stroll back to check out the Premium Economy section. Its seats are narrower and also have access to the entertainment system. They would be a good option for a shorter, daytime-only trip. Back in my seat, I see mango trees and palms near Bowen. The vivid green is a reminder of the recent wet season, and how fertile the rain makes the tropics. Dinner is served to Railbed customers at their seats, and my order – pumpkin and spinach in filo pastry, Greek salad, custard tart and a glass of shiraz – is quite acceptable quality for a restaurant in motion. At 8pm an attendant sets up my bed. A remote control is plugged into a socket and the seat-back folds forward to reveal a mattress. The attendant lays a sheet and duvet atop it, folding down the latter with a flourish. 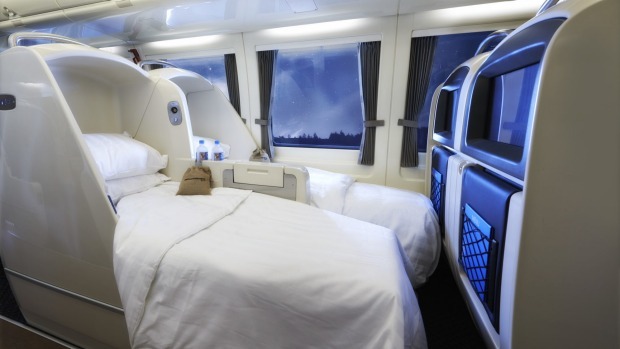 The mattress is softer than lie-flat business-class seats I've experienced in the air. The lack of privacy is a drawback compared with the classic sleeper train compartment, but at least there's no need to climb to an upper berth. I eventually drop off, though occasionally wake and peel back the Velcro-fastened curtain to examine silent towns by moonlight. After a morning shower, there is only a few hours' travel through the Sunshine Coast region remaining. Craggy highlights include the volcanic plug of Mount Cooroora, home of the King of the Mountain foot race; and further on, Mount Ngungun in the Glass House Mountains. We pull into Brisbane's Roma Street Station just before 10am and I feel unexpectedly shell-shocked as I walk out into the CBD's busy streets. I was in sync with the relaxed vibe of the tropics and the rhythm of the train, but now it's back to big-city pace. Tim Richards travelled courtesy of Queensland Rail Travel, YHA Australia and Accor Hotels.